How to Make Homemade Vanilla Extract! Imitation vanilla is made with some questionable ingredients I prefer not to put in my body. 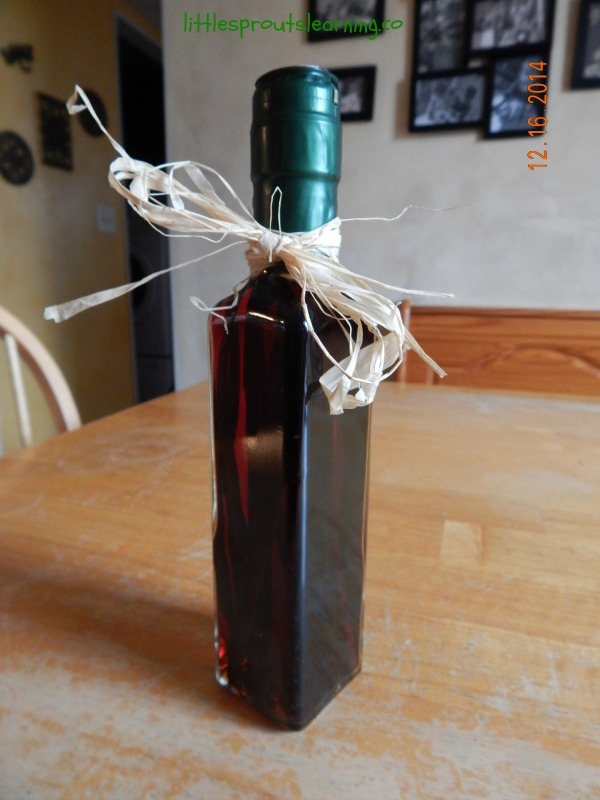 Homemade vanilla extract has a wonderful taste and aroma. You won’t want to go back to imitation after you’ve tasted it. 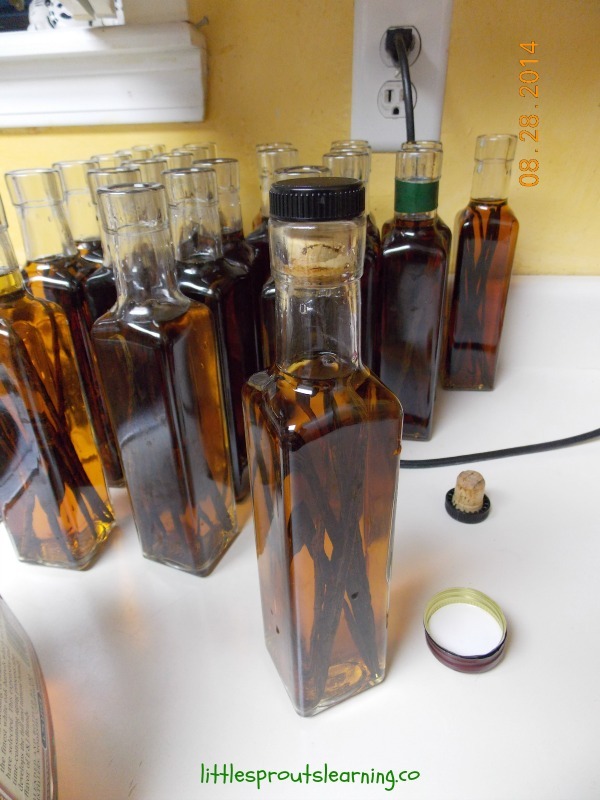 It’s not that hard to make your own homemade vanilla extract at home. Ingredients in imitation vanilla can be harmful to your health. One of them is made from the by-products of wood production. No thanks. You can read about it here. I also have an aldehyde allergy, so imitation vanilla cause a reaction in me. 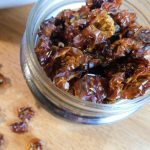 Real vanilla extract costs an arm and a leg, so a few years ago, I started making my own after my Mom made me some for Christmas. 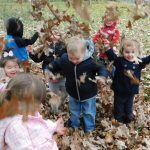 It’s super easy and fun to do. All extracts are made by steeping ingredients in alcohol until the alcohol takes on the flavor and scent of the ingredient. 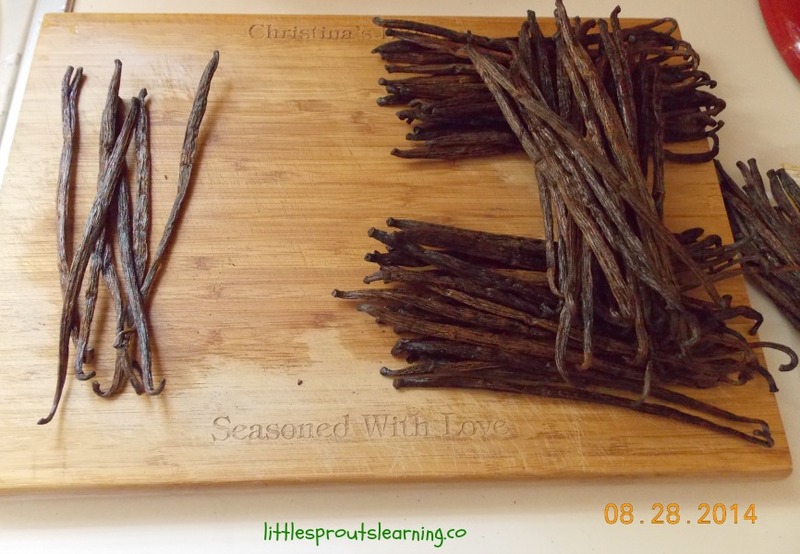 To make vanilla extract, begin with vanilla beans. 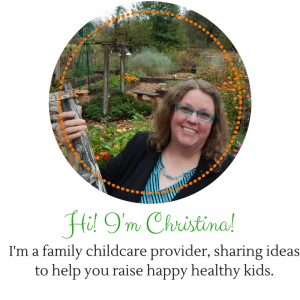 You can buy them in bulk online or get them from your grocery store. Obviously bulk is less expensive, and I’m into that! I use Madagascar beans to make my vanilla. Next, you need alcohol. Vodka and brandy work well. I use brandy because I think it makes better vanilla. It takes about a cup of brandy and 6 vanilla beans to make a batch. I buy everything in bulk and make around 24 bottles of vanilla at once. I occasionally use it for gifts, but I bake a lot and use a lot of vanilla, so I use many of them myself. The last time I went to buy the brandy, the cashier asked me if I was having a big party, or just stocking up. I don’t drink any kind of alcohol and I find it hard to understand how anyone likes it, so I got a good chuckle out of that. 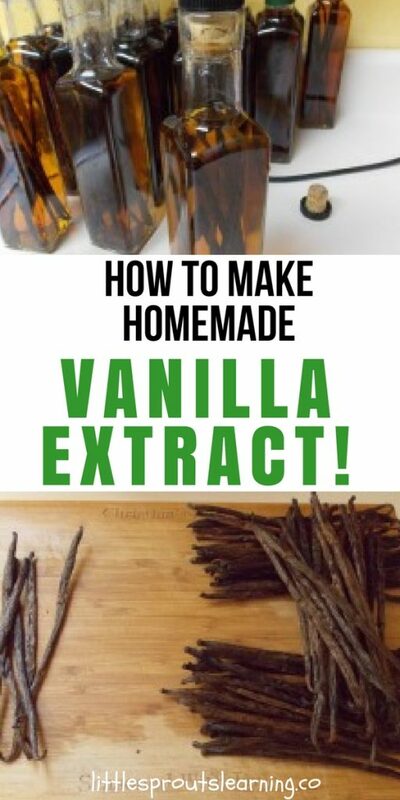 You need some glass jars in which to make your vanilla. Mason jars, jelly jars, or whatever you have on hand is fine. I bought some jars with corks several years ago and I just reuse them for each batch. I bought some shrink wrap seals to put on them when I give them as gifts and they look wonderful. Slice each one of your beans down the center starting almost at the top and running down through the end of the bean. I leave the top attached because I think the whole bean looks lovely in the jars. Next, work the beans down into the jars one at a time until they are all resting on the bottom of the jar. Then fill your jar with alcohol to cover the beans. Once the jar is filled, place the lid or cork on the jar and store in a cool, dry place. Every couple of weeks you can take your jars and turn them over to make sure all areas of the vanilla bean are getting steeped and then place them back in your storage area. It takes about 6 months for the vanilla to permeate the alcohol and turn into vanilla. If you want to give vanilla as Christmas gifts, make it in the summer, and you’ll be ready to go. One less thing to get done in December. Super easy peasy, that’s it! Try to make some vanilla and you’ll be hooked. It tastes so much better than store bought and you know exactly what goes into it. Hello! Great idea! 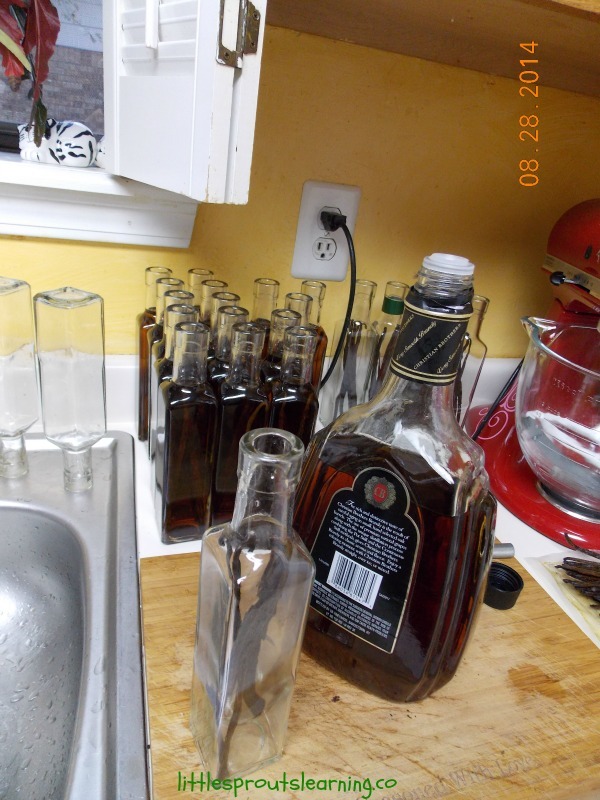 Quick question about what you use in each bottle… You said you use about 6 vanilla beans for a batch–does that mean 6 beans per bottle or do you cut up the 6 beans into segments and put them in the bottles? Essentially, I’m wondering how many vanilla beans you’re putting in each (what looks like 4 oz) bottle. Love this! Where do you find your vanilla beans in bulk? Because when I’ve seen them at the grocery store, it can be almost $10 for just a few full beans. I’d love to find a better price and get started making vanilla! I order mine online from beanilla. https://www.beanilla.com/madagascar-vanilla-beans I buy the grade b and get the Madagascar ones. Don’t through the beans when the vanilla is gone. 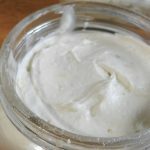 You can put some in a canister of sugar to make vanilla sugar for sprinkling on top of foods or in coffee and in things like custards and ice cream bases you can add them while cooking and remove the bean before finishing the recipe. 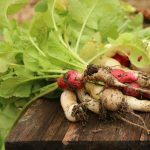 Good suggestions, I usually scrape the seeds out of my spent beans and toss them in a recipe too. I didn’t think about making vanilla sugar with all of them, great idea! Thanks for reading! 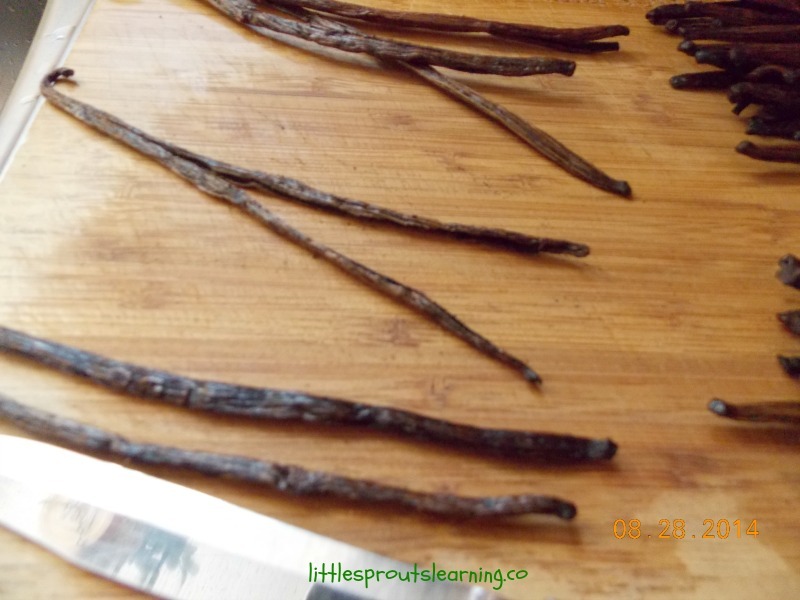 Thanks so much for sharing how to make vanilla extract. Would like to know whether l could use this to make cold process soaps? Would really appreciate if you could enlighten me on this.